The City of Saskatoon, lovingly called the Paris of the Prairies, is located in Canada’s Saskatchewan province. In 2009, the city council voted to build a new 130,000 square-foot contemporary art museum on the banks of the Saskatchewan River. 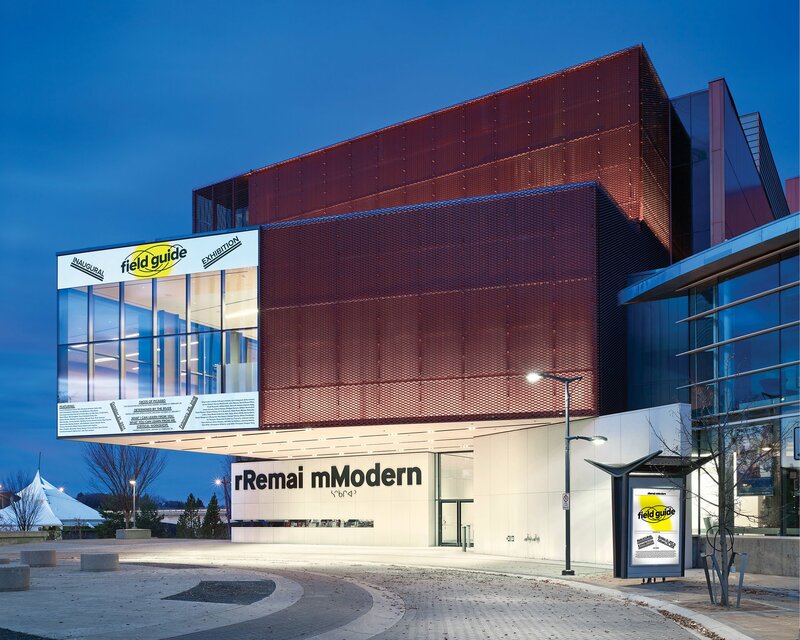 When the Remai Modern finally opened in October 2017, it became one of Canada’s largest contemporary art institutions. For this newly founded institution’s branding, signage, wayfinding, and web design, karlssonwilker worked directly with Director and CEO, Gregory Burke. Our close collaboration started early 2015, which allowed for a wealth of discussions and explorations that would help shape this project. Screenshot of one of the many Illustrator files, showing initial type sketches. In parallel with the design of Remai Modern’s Visual Identity, we developed a Pre-Opening Campaign. The Pre-Opening initiative included a website and multiple pieces of collateral for events. In these designs, we used the sketches, ideas and strategies that were the base for the final Visual Identity. While developing the graphic design identity, we explored a broad range of directions. Gradually, the “lower/UPPER” approach manifested itself as the ideal gesture for this Museum’s continuous quest to question itself and everything else on their path to become a sort of anti-institution institution. The logotype is a custom extra heavy version of Maison Neue (Milieu Grotesque, Cascais)—before Maison Neue Black was released. Proxima Nova (Mark Simonson, St. Paul) is used for all print and online communication when available. Every seventh stationery set comes in yellow, for the staff to be surprised by a strong yellow once in a while. Remai Modern is situated on Treaty 6 Territory and the Homeland of Métis. From the start, the Museum wanted to pay their respects to First Nations and Métis ancestors and reaffirm their relationship with one another. This was also to be communicated in the institution’s identity – to the local as well as the global audience. Interviews and discussions throughout the different communities were undertaken for the design team to react to the local needs and wants. Cree syllabics are used in some logo applications as a lock-up—the syllabics themselves a phonetic re-translation of “Saskatchewan”— determined through consultation with Cree scholars. Designed by Bruce Kuwabara of Canadian architectural firm KPMB, the building responds to the low, flat topography of the landscape. It features intimate as well as dramatic expanses and exhibition spaces, changing galleries, a 150-seat theater, environments for gatherings, with fireplace and open lounge areas, an art and design store, an exceptional restaurant, as well as an active learning studio. Signage and wayfinding, as well as screen design for the many monitor banks inside the museum. All wayfinding features yellow backing, which allows for a subtle glow around the signs and individual letters. The museum’s in-house team now works with and applies the brand identity we supplied them in a 102-page style guide. While the institutional identity focuses on the logo, a color scheme of anthracite and warm yellow, and idiosyncratic logo patterns, all programming collateral is based on “The Saskatoon Sentinel.” This was a hand-written and-drawn newspaper from 1884 that we discovered in the City’s library archives on one of the initial visits. Struck by the naïveté and passionate commitment of the creator of the eccentric newspaper (which was handed out house to house throughout the city back when the population was just under 100) as well as the evident sense of play, we incorporated several of its design motifs, including the newspaper’s rampant double and triple underlined, angled, and opposing headlines. Printed collaterals are based on "The Saskatoon Sentinel", a hand-written, one-off newspaper from 1884 that we found in the City's archive. Back in the day, the original newspaper was handed out from household to household. Bringing its energetic amateur style to today, the idiosyncratic layout became the starting point for Remai Modern's program-related visual communication. Sample posters, used in presentations and style guide. Being brought on early in the overall process meant that there was more time to better strategize and plan Remai Modern’s online platform, resulting in a pre-opening version of the website that featured bespoke web commissions that were exhibited on the landing page over a year prior to opening. De facto using the website as an extension of their gallery space, putting art first, as was the guideline for the Museum. The web commissions are still ongoing, albeit at a lesser neck-braking turnover of three months than their previous one month turnover. The Museum’s brand film had to work without any pre-existing footage and material, as the museum was still under construction. Big questions were suspended over vast prairie skies, introducing this brand new contemporary art museum to the world.